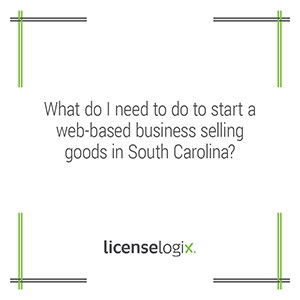 What do I need to do to start a South Carolina web-based business? There may be multiple business licenses that apply depending on the type of goods sold. County and city licenses may also be required depending on where the business is located. At a minimum, the business will need a South Carolina Retail Sales Tax Registration. The state charges a fee of $50.00 to obtain this registration. Any additional locations of the business must hold their own registration. Please note that even web based online retailers must obtain the SC Retail Sales Tax Registration.